Biotech giant Monsanto announced it would spend $4 million on efforts to save the monarch butterfly population after the company’s pesticides have been accused of destroying the insects’ habitat and bringing them to the brink of extinction. The St. Louis-based company said Tuesday it would contribute $3.6 million over three years to the National Fish and Wildlife Foundation's Monarch Butterfly Conservation Fund. Another $400,000 will go to universities and conservations groups trying to rescue the species. Monsanto’s announcement claims the company will expand and improve “more than 10 million acres of quality, distributed habitat by 2025,” provide 100,000 milkweed plants for planting in “priority landscapes,” and reach 100,000 growers with guidance plans to create and protect monarch habitats, among other things. According to a study by the Center for Food Safety, close to 99 percent of milkweed in the Midwest’s corn and soybean fields has been destroyed by pesticides such as Monsanto’s Roundup, the most common herbicide in American agriculture today, used in tandem with the company’s genetically-engineered Roundup Ready crops. Milkweed plants are the only spots where monarch butterflies lay eggs and the only food source for their larvae. Since Roundup’s introduction, the number of monarch butterflies has drastically dropped, from one billion in 1997 to 56.5 million this past winter, according to the Center for Biological Diversity. The finding was cited in a February lawsuit filed by the National Resource Defense Council (NRDC) against the US Environmental Protection Agency (EPA), over the agency’s approval of Roundup for use. The Center for Biological Diversity, the Center for Food Safety and the Xerces Society for Invertebrate Conservation have petitioned the US Fish and Wildlife Service to list the subspecies of monarch (Danaus plexippus plexippus) as endangered. The orange-and-black spotted monarchs are renowned for migrating several thousand miles across the US, Canada and Mexico. 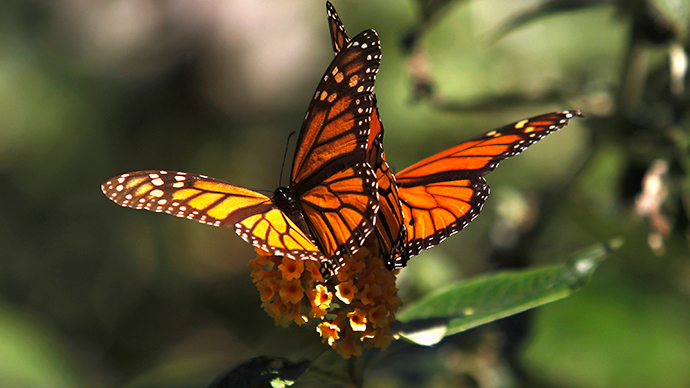 In addition to their natural beauty, monarch butterflies play an important role in ecology. They carry pollen from plant to plant, helping fruits and flowers to produce new seeds. In their caterpillar stage, they are a food source for birds, mammals and other insects. “While weed management has been a factor in the decline of milkweed habitat, the agricultural sector can absolutely be part of the solution in restoring it,” said Monstanto President and Chief Operating Officer Brett Begemann in a statement Tuesday. Among the recipients of Monsanto’s grant money is the University of Guelph in Ontario, Canada, which is tasked with identifying priority areas for milkweed restoration. Monarch Watch, a research group at the University of Kansas, would produce and distribute milkweed on public lands along the butterflies’ migratory path. The University of Illinois at Chicago has a program to identify and prioritize available public and private lands for seeding with milkweed, while the Iowa Monarch Conservation Consortium is supposed to work with farmers.